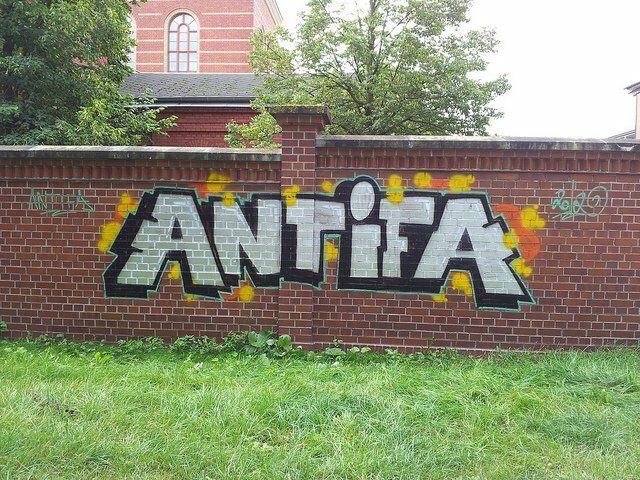 Antifa graffiti. Credit: Flickr/Oliver Wunder. CC BY-NC-SA 2.0. These confrontations between far-right activists and antifa groups—on the rise since the election of Donald Trump—are often presented as involving two opposing values: free speech on one side and the danger of allowing fascists to appear in public on the other. What is missing in this framing, however, is an understanding of the dynamics of censorship and of nonviolent action as an alternative. Bray readily acknowledges that “Antifa” was written “on the run” during the early days of the Trump era to meet the demand for information about newly visible anti-fascist activists. As Murray, one of Bray’s anonymous U.S. informants puts it, “You fight them by writing letters and making phone calls so you don’t have to fight them with fists. You fight them with fists so you don’t have to fight them with knives. You fight them with knives so you don’t have to fight them with guns. You fight them with guns so you don’t have to fight them with tanks.” Beyond punching Nazis, antifa tactics drawing significant media attention include “no platforming”—or blocking or disrupting speeches—and “doxxing,” which consists of publishing private information about a target on social media to encourage harassment. Despite its genesis as instant history, “Antifa” is a serious book that raises fundamental questions about the viability of liberal tenets of free speech and the role of violence in political protests. Bray, a historian, visiting scholar at Dartmouth College and an Occupy Wall Street organizer, used his radical credentials to gain access to the antifa network, which generally operates in secrecy. He interviewed 61 active or former members of antifa groups from 17 countries. Supportive of the goals of antifa, but open to criticism of the movement, Bray argues that “militant anti-fascism is a reasonable, historically-informed response to the fascist threat that persisted after 1945 and that has become especially menacing in recent years.” The authorial voice he projects is humane and reflective, occasionally punctuated with references to his personal history and activist experiences. The first two chapters are devoted to the history of fascism and anti-fascism, from the 1899 founding of the anti-Dreyfusard League to the early 2000s when antifa groups began to rethink their strategies in light of the rise of new far-right parties in Europe. While historical contextualizing is essential to understanding antifa’s “never again” rationale for preventative violence, Bray packs too many facts into too little space for readers without a deep background in European history to readily absorb and retain, making these crucial early chapters a hard slog. This is unfortunate because the subsequent chapters are accessible and illuminating. Chapter Three addresses the recent emergence, in response to the refugee crisis in Europe, of “pin-stripe Nazis”: nationalists who cover their underlying fascist tendencies with a veneer of respectability. They claim to be protecting democracy against its enemies while providing a cover for racism, Islamophobia and restoration of patriarchal gender regimes. The conundrum of no tolerance for intolerance. When Richard Spencer announced on Twitter that he was canceling his “college tour” because antifa had escalated its efforts and—in his view—police were not responding adequately, it seemed like a victory for antifa. If so, it was pyrrhic. Antifa’s tactics, which attracted hostile media coverage, did little to advance struggles against racism, patriarchal gender regimes, ableism and the other causes the movement supports. Intentional bureaucratic obstructionism by various university administrators may have done as much to undermine Spencer’s tour as antifa. For example, he decided to quit the tour when only 12 people showed up for his appearance at Michigan State University, which scheduled his talk during spring break when most students were away from campus. Bray faults liberal free speech theory for its failure to live up to an absolutist standard of free speech and for its hypocrisy. Yet, in doing so, he unwittingly encounters the conundrum that has dogged free speech theorists for centuries: what Karl Popper referred to as “the paradox of intolerance” in his 1945 work “The Open Society and Its Enemies.” Any system that legally valorizes tolerance, regardless of its ideology, must—by logical extension—resort to intolerance of the intolerant. Like liberalism, antifa and Bray are also caught in this logical trap. As Bray puts it, “An anti-fascist outlook has no tolerance for ‘intolerance.’” Yet, antifa is founded upon aggressive intolerance of fascists. Democracy has always been aspirational. Free speech is a desired goal, though very unevenly realized in practice. Bray persuasively chronicles some of the many failures of liberal democracy and free speech, and underscores the importance of radical struggles for greater economic and social justice. Antifa’s binary framing of choices—speech or violence—does seem to give Bray pause at times, as it should. He contends that the society that anti-authoritarians seek to create would offer more opportunities for free expression than the liberal status quo. For antifa, that is a society inspired by revolutionary socialism; for Bray, preferably one that is anti-authoritarian and non-hierarchical. Justifying violence on moral, not strategic, grounds. Bray presents violence as the alternative to liberal approaches, which rely on rational discourse and policing. Certainly, liberalism has often failed to deal with right-wing threats. However, there is another alternative: nonviolent action, the strategic use of petitions, rallies, strikes, boycotts, sit-ins and a host of other methods. This alternative has a rich history—including, for example, countering fascists using clowning. Bray can hardly avoid discussing nonviolent action because it is now used widely in contemporary social movements.